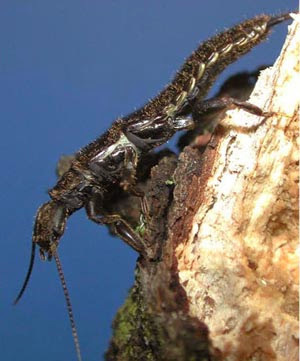 Female Antipaluria urichi, photographed by J. Edgerly-Rooks. The Embioptera, webspinners, are a group of small, retiring insects that construct silken galleries in secluded habitats. Female webspinners are wingless; mature males often have wings, but may lose them after dispersal. See also: A seclusion of Embioptera. Characters (from Rasnitsyn 2002): Size moderate to small. Body elongate. Head large, prognathous, with postoccipital sclerotisation between mouth cavity and occipital foramen, lacking ocelli. Antenna filiform, 12-32-segmented. Mouthparts chewing, male with mandible modified more or less, submentum often shield-like enlarged, sclerotised. Lateral cervicalia divided into 2 pieces. Pronotum lacking paranota. Meso- and metathoraces similarly shaped. Females and many males wingless, nymph-like more or less in thoracic morphology. Wings narrow, homonomous, poor venationally, highly flexible including veins, thus permitting wing to flex over head in backward running in silken tubes. Veins and particularly R surrounded by blood sinus working as vein at flight when filled with blood. Most complete venation with 11 branches only (not counting C) and several weak cross-veins, still more reduced in other representatives. Flight functionally four-winged, in-phase, anteromotoric. Legs short, femora stout (particularly fore and especially so the hind ones), tarsus 3-segmented, fore basitarsus inflated due to silk gland inside. Abdomen cylindrical or, in male, somewhat depressed, 10-segmented, with cercus 2-segmented, male left cercus usually modified and used in copulation. Male genitalia asymmetrical. Ovipositor lost. All stages living in groups in silk tubes spun using fore basitarsal glands under bark, stones, or, in humid climates, externally on substrate, feeding on plant material, mostly dead matter. Female guarding eggs and younger nymphs. [R02] Rasnitsyn, A. P. 2002. Order Embiida Burmeister, 1835. The webspinners (=Embioptera Shipley, 1904). In History of Insects (A. P. Rasnitsyn & D. L. J. Quicke, eds) pp. 291-293. Kluwer Academic Publishers: Dordrecht. [R63] Ross, E. S. 1963. The families of Australian Embioptera, with descriptions of a new family, genus, and species. Wasmann Journal of Biology 21 (2): 121-136.